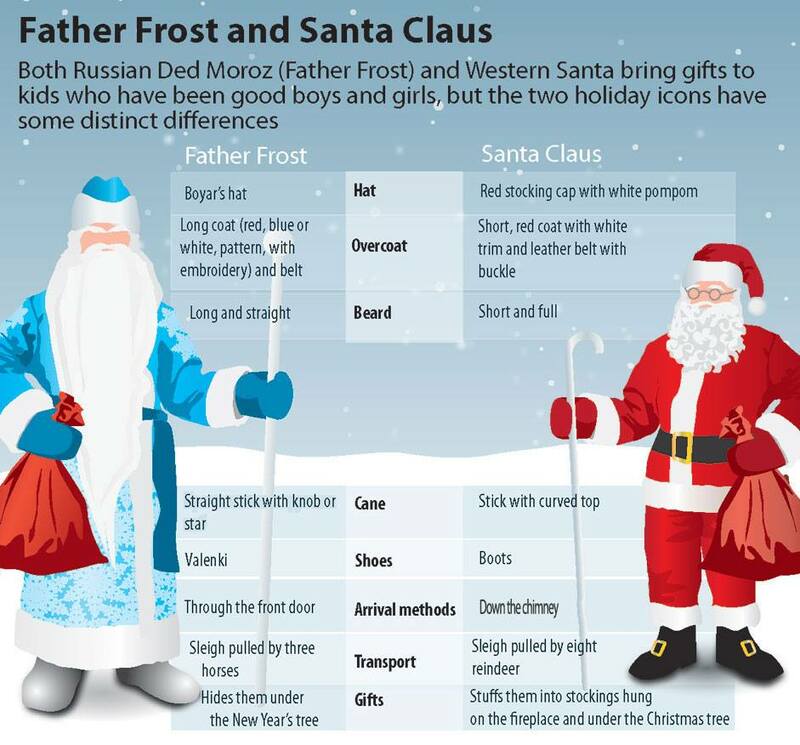 Ded Moroz (pronounced “Dead Morose” and meaning Grandfather Frost) is the reigning St. Nicklaus or Santa Claus in Russia — with an ever evolving story! For over 400 years he and St. Nicklaus have competed for the number one spot giving gifts to good children. Happy New Year! Here Ded Morose is seen in a red robe instead of traditional blue, often attributed to European influence and St. Nick. St. Nicholas was the gift giving saint for children in Russia for many years as in the catholic tradition. St. Nicholas’ feast day is still practiced December 6th in Russia and many other countries. However, as the Russian Orthodox Church separated from the Catholic Church traditions changed. During the reformation in the 1600’s there was a desire to separate some of the traditions as well. In the 1800’s Ded Moroz, a figure in old stories with an ability to do good and bad, began to replace St. Nicholas as the gift giving saint. Ded Moroz is a tall man with a long white beard. He wears a long robe, traditionally blue with white accents. 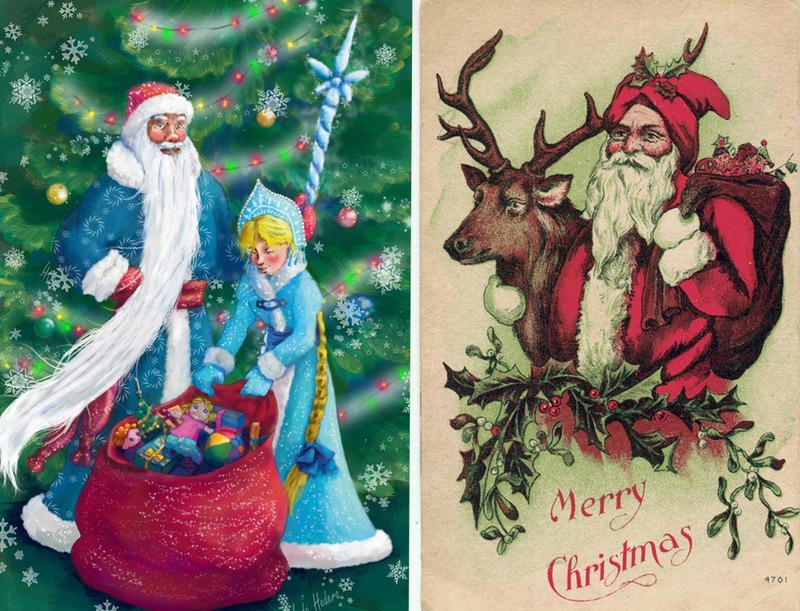 Ded Moroz, the friend of children, became much more than the spirit of Frost from old folklore. He now travels in a Russian troika , a three-horse sleigh, and often is seen with his grand-daughter, Snegurochka, the snow princess, helping Frost. They travel from town to town, giving gifts to the good children and ignoring those who had been bad. However, after the Bolshevik Revolution in 1917, Vladimir Lenin outlawed organized religion and many religious traditions were made secular. Christmas was abolished and New year was the holiday for the family to celebrate around the new year tree. Ded Moroz officially disappeared. But he did stay in the hearts and homes of Russian people. 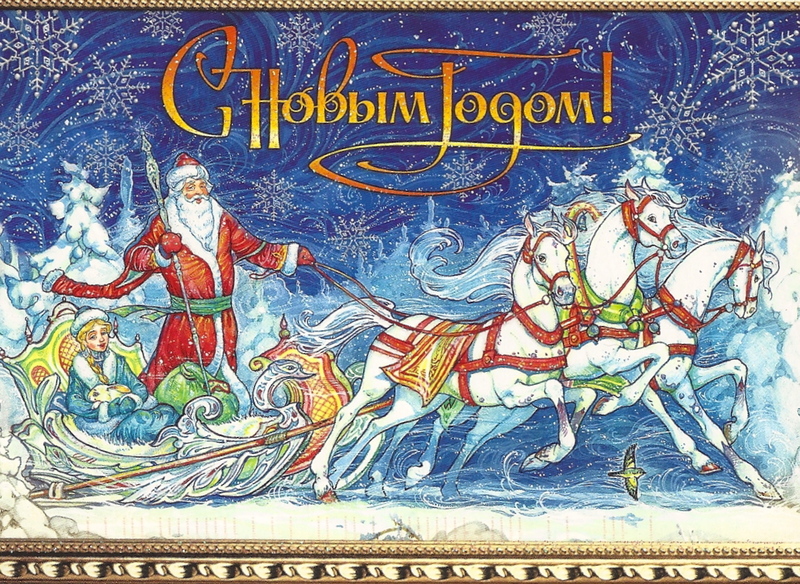 In 1948, Josef Stalin restored New Year as a National Holiday and Ded Moroz as the friend of all Russian children. Ded Moroz now arrived on New Year’s eve in his troika and he and Snegurochka once again brought gifts to all good children. Once upon a time, one old story says, Grandfather Frost had a wife named Winter who bore three sons: December, January and February. 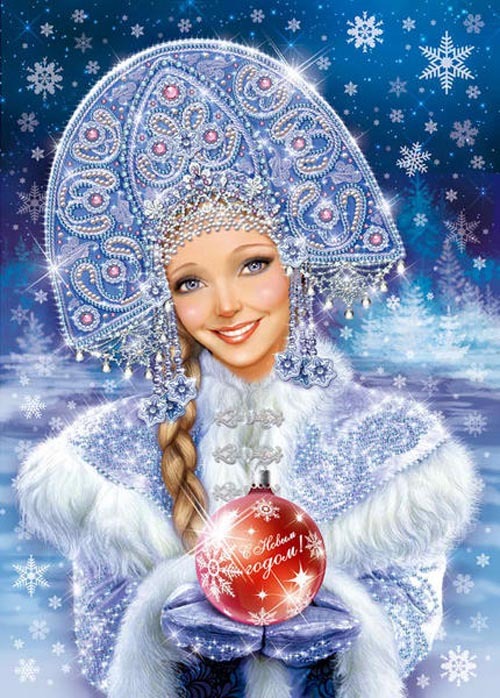 A girl named Blizzard, who dated all three sons, married December and gave birth to a girl called Snegurochka, the Snow Maiden. Grandfather Frost and his grand-daughter Snow Princess always come together in December to bring gifts to the good girls and boys. In the United States, a red-clothed Santa delivers gifts on December 24 in a sleigh pulled by reindeer, landing on top of houses and bringing gifts down the chimney. While in Russia, a blue-robed Grandfather Frost delivers gifts to children on New Year’s Eve on the street and through the doors of all good children. Sometimes, Ded Moroz has appeared in red robes and on other Winter holidays. In fact, he may be seen in a wide variety of colors and fashionable robes. Santa Claus hasn’t changed his outfit much since Victorian times! To further complicate, or benefit, Russian holidays, the Gregorian calendar was implemented in Russia in 1918 over the Julian calendar. So to this day, Russian people continue using both the Julian and Gregorian dates for many holidays. The Orthodox Church continues to use the Julian calendar. In practice, many religious holidays have a Catholic date and an Orthodox date. And since 1991 The Orthodox faith has been officially practiced in churches and cathedrals. It never really disappeared, it simply became private during the Soviet years. 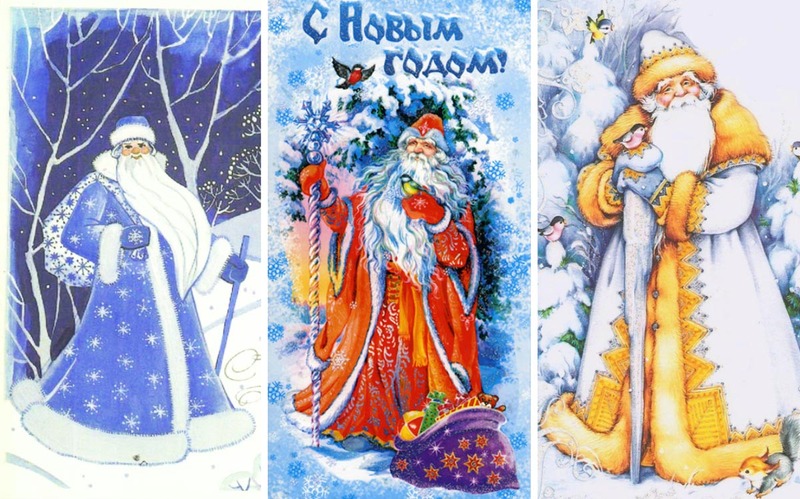 Thus, in Russia, Christmas eve is Dec. 24 and Christmas day Dec. 25, as with the usual Catholic date, then again on Jan. 6 and 7, the Old Russian Christmas, or Orthodox Christmas. Orthodox Christmas is almost completely a celebration of the birth of Christ as the holiday first started. Similarly, New Years eve is largely practiced Dec. 31 and New Year”s Day Jan. 1. And again, Old Russian New Year is practiced Jan. 13 and Jan. 14, Старый Новый год. Or just to say Merry Christmas – Schastlivogo Rozhdestva! Through all their differences, both Ded Moroz and Santa continue to agree that all good children are to be encouraged and rewarded.